Windows7 sports all new taskbar in terms of looks and components placement. For example, clock on system tray also show day-date information besides the time. It looks cool and render different looking clock area on the system tray. Now you can get similar clock on your Vista or XP computer using small utility TClock. Just download, unzip the file, then double click on Tclock icon to run this utility (yeah, no installation required). 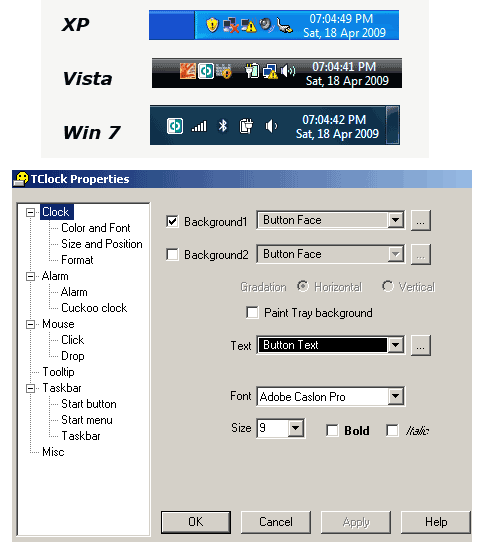 Right click on new Windows7 like clock to access different options and settings to customize font, size, positioning and other aspects. Download Tclock [link – via askVG] for that new looking clock area on your XP or Vista desktop. How to Watch Youtube Videos in Vista Media Center? Thanks Gregg! Been lookin’ everywhere for this! Along w/ ‘classic shell’ Win 7 is working like a champ. Thank you for keeping this amazing little app available. Most of us old-timers who have used T-Clock since back in ’95 when Kazuban first wrote it, generally agree that the best version ever written was a subsequent one by a fellow who called himself “Stoic Joker.” His has a few features removed, but we all agree that that actually improved it… certainly made it lighter and less resource-intensive. His version is also the one which seems to work best in Vista… even 64-bit Vista. I haven’t tested it yet, but it may even work in Windows 7 (and it certainly works in XP and older versions). Sadly, Stoic Joker’s web site (from which one would expect to be able to download his version of T-Clock) is down more than it’s up. In fact, lately, it’s down pretty much all the time. Why is unclear. He made a posting in a forum in early 2009 saying he had had some kind of catastrophic system failure as a result of which he lost his most recent code versions… maybe that has something to do with it, I don’t know. All I know is that, as a long-time T-Clock user who believes that Stoic Joker’s is the hands-down best version; and as one who is frustrated that it’s so darned hard to find a copy of it anywhere out there, I decided to mount my own “unofficial” T-Clock web page from which the world may download it, and on which I provide some useful configuration information (which people have told me isn’t available anywhere else out there). There’s no advertising on my page, no adware/malware, no gimmicks, no ulterior motives. I’m just trying to help.